Lisette Titre-Montgomery has contributed to some of the industry’s highest profile games, including Tiger Woods Golf, Dance Central 3, and her most recent project: The Sims 4, set to be released in Fall of 2014. 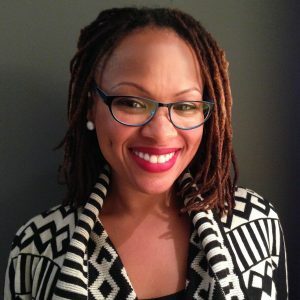 Ms. Titre’s passion is publicly advocating for game based educational curriculum’s designed to expose under served youth to careers in technology. Lisette has been a keynote speaker at N.A.S.A., Intel, the San Francisco Environmental Protection Agency. She has also been featured on NPR and in the New York Times. I’m currently reading David and Goliath: Underdogs, Misfits, and the Art of Battling Giants by Malcolm Gladwell. It’s an amazing book on how challenges strengthen those who survive them. I recommend it for anyone who is trying to persevere through hard times. When I saw the movie Toy Story in 1995. I knew that it was going to change graphics how we knew it, and I was hooked. I went to school for computer animation and got my first game job a month after moving to the Bay Area with two suitcases, my NT workstation, and what was left of my meager tax return. Looking back on it now, I think I was one lucky chick. Game students have it much harder these days. Oh man, there are so many… My favorite lesson was from being passed up for a promotion. The politics on a particular project I worked on was TERRIBLE. Everyone was fighting, people were quitting and getting “laid off” left and right. I was a little soft spoken at the time and afraid to stick my neck out so I let my lead do all the talking for me. HUGE MISTAKE. When a lead position opened up I was sure my skills and extra long hours of hard work would land me the position. WRONG. Never let anyone in this industry speak for you. Never. Now I always make sure I have a seat at the table so I can make the best decision for myself and the people on my team. Black Enterprise Magazine did a feature on Women In S.T.E.M. in the March 2011 edition. Not only was I honored to be featured, but I also got the cover. My favorite part about landing the cover had nothing to do with the small ego boost I felt for being recognized nationally. It was the outpouring of letters and emails I got from students and their parents all over the country who were surprised and happy to see someone who looked like them making video games. It made me realize that I needed to begin talking publicly about what I do so that people of color could see the career opportunities that are available in game development and the tech field. “Get comfortable with being uncomfortable.” One of my best managers told me that early in my career. If you get stuck in your ways in the game industry you will get left behind. My daughter is 18 years old and graduating from high school this month and going onto college in the fall. So if you do the math, you’ll realize that I was a teenage mother. I’m very lucky that I got to pursue my education and a career of my dreams when most women who make that choice so early do not. I owe it all to my hard working and supportive family. I am very blessed that I could be a single mother and have a career in this crazy industry. Game and tech companies are starting to realize that creating a culture that promotes diversity is key to making profitable games. The demographics of gamers has changed dramatically thanks to smart phones and tablets. Women and people of color are making more games now than ever before in our industry’s history. I am excited to see the new play experiences that come from having more people with different perspectives expressing themselves through games. I think the best games have yet to come and we are just getting started. My advice is to always be kind, honest, and dependable to the people you work closely with in this industry. The company logo on your paycheck is always going to change. Layoffs will happen. Companies merge and close all the time. However, your professional reputation, your skills and work ethic, and most importantly, your network will get you the next job.